We’ve put together this quick guide to help you get the most from our energy comparison site and to get to your results as quickly and easily as possible. If you’re new to the site please skim this first. Even if you’ve used us before, you might find a few things in here you weren’t aware of. On the results page we show you our range of energy offers from vetted energy suppliers. We calculate your new bills and your savings and show a bunch of other detailed product information. Nothing new there right? However, our results page has a few award-winning quirks which we think you’ll like. Like showing all your results in a simple interactive sortable graph. So please do check it out. To get you to the results page we ask for 3 types of data. Selecting your address allows us to do a “behind-the-scenes” check against industry data to identify the meter(s) at your property. This helps in the following ways; (1) by allowing us to customise your search to show only tariffs relevant to you and (2) saving you the hassle of having to find and enter meter numbers later in the application form. Enter your postcode and house number (optional) and select your address from the list. If you can’t find your address, don’t worry. Just select “my address is not listed”. We’ll still return results based on your postcode but, if you chose to switch, you’ll need to enter your address manually in the application form later. 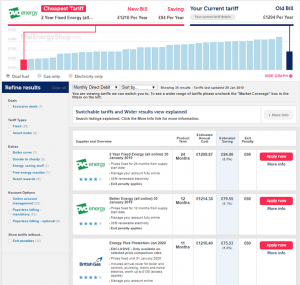 This allows us to compare your current tariff with alternative offers and to calculate any savings you can make (real savings that is, unlike some of the made-up fictional numbers on many energy comparison sites). TIP: If you do a dual fuel search you will still have the option of seeing gas only and electricity options using filters on the results page. Do you have an Economy 7? Economy 7 is where you have a 2-rate tariff that charges different rates dependent upon time of day. You pay a higher rate for day (peak) usage and a lower rate for night (off-peak) usage. Economy 7 refers to 7 hours of off-peak usage with the exact times depending upon your energy supplier and tariff. If you have an Economy 7 meter installed at the property tick the “I have Economy 7” box. This will return Economy 7 tariffs for comparison and show only tariffs relevant to your meter setup. If you have never heard of Economy 7 then you can probably ignore this question, although it is always best to check to be sure. TIP: Please note that if you do have an Economy 7 meter fitted and then make an application for a standard electricity tariff, your application will likely get rejected. 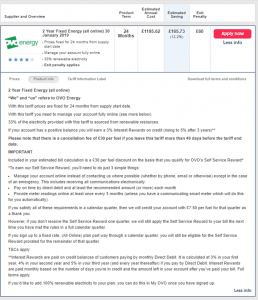 Then it’s a simple case of selecting your current energy supplier, payment method and tariff from the drop-down lists. 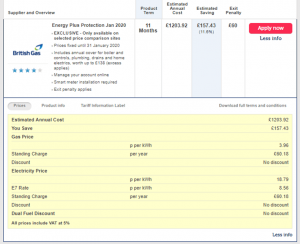 Finally pop in your energy usage details so we can calculate the best deals for you. You can do this using any one of the 3 options available. Your spend in £ (pounds): from this we calculate your energy usage but it may not be accurate for lots of reasons like if your energy prices change or your energy spend and usage are out of sync. You can use or simple estimator – this is based on Ofgem calculated typical consumption profiles for low, medium and high energy users. TIP: You can enter your usage either using the sliders or (if you find this fiddly on certain devices) just click inside the usage box and enter the value in numbers. TIP: Don’t forget to set the usage period. This is pre-set to annual usage but if you are estimating bills based on a single bill either multiply up the usage to get a year’s worth, or set the period accordingly (monthly, quarterly or annually). If you have an Economy 7 meter enter the percentage of your total usage that is used at night / off-peak. That’s it. Hit the CONTINUE button and the spinner will tell you that your results are on their way. So, you’ve got to the results table. Here’s the low down on what you’ll find. We’ll go through the individual components starting from Top left -à Top right and then work down the page. Firstly, our totally unique feature…the interactive graph…showing all your results in a single screen. No scrolling though pages and pages of results anymore. All your choices in one (pretty? – we think so) picture. The graph shows you all the tariffs available through us, cheapest first (left of graph and top of table). Above the table, the summary bar highlights the tariff you are viewing (connected via the red line) together with bill value and savings by switching to that tariff. As you scroll along the graph the selected tariff will update as will your savings. On the right above the graph we show you your current tariff (dark blue bar) so you can easily see how it compares with the other offers. If you don’t like the graph (boo hoo!) you can remove it by clicking the “HIDE GRAPH” button below the graph (right hand side). Below the graph you’ll find filters and sorting options – more on those below. There are also more detailed filters to the left-hand side of the table. Finally, the table lists details of the tariffs we can offer you. Tariffs are listed strictly in terms of price order (cheapest first) although please note that if you change the sort order, that will change. 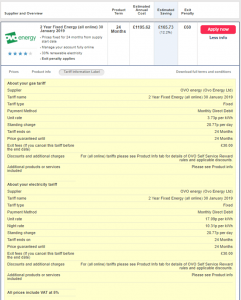 Each tariff in the table has its main features summarised, including annual cost (based on your energy usage figures), estimated saving, tariff term (where it has an end date) and exit penalty. 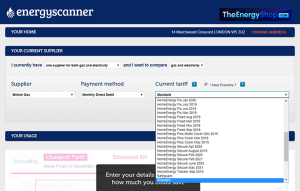 You can access more detailed information about each tariff by clicking on “More info” in the right-hand column of the table (underneath the “Apply” button). Clicking on “More info” in the right-hand column of the table opens up the price details about the tariff. Product info provides more detailed information about the tariff. We recommend you read this if you are thinking of applying for a tariff. This provides detailed regulatory based information about the tariff – it is a bit much but we gotta show it. And if you are into the small print you can even view and download the Terms and Conditions by clicking on the….wait for it….”Download full terms and conditions” link. Be warned these documents run to dozens of pages. You can filter by fuel type (gas, electricity and dual fuel) but only if you started with a dual fuel search. These options are immediately below the graph. You can also display tariffs according to your preferred payment method. The pre-defined setting is monthly direct debit as this is the cheapest way to pay – and we know you are looking for a deal. 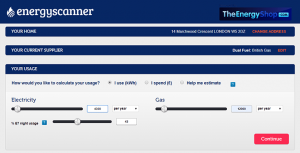 You can narrow down your tariff options by using the filter on the left-hand side of the table. To reset the filters and return to showing the default setting just click the “Clear All” link. You can sort your table in one of 2 ways. By clicking on the headers in the Table – this will re-sort the table and graph according to the parameter. By using the sort box – below the graph, above the results table. Scrolling along the chart will show you the alternative offers and savings. That way you can see all your choices without having to scroll down endless list of energy tariff options. Really useful if you’re viewing the site on a smaller screened device. 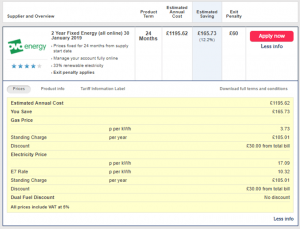 You can narrow you tariff options based on their features using the Refine Results box on the left. You can also Sort you results using a number of different options. This will re-sort the graph but still show all your options so that you don’t accidentally remove and so miss a cheaper or better tariff. For example, if you select only fixed deals, the graph will grey out (but not hide) non-fixed options. This means you can still see how your chosen deal compares with other alternatives that you’ve greyed out. Clicking on a bar of the graph takes you to the tariff you’re interested in. No fiddling around. You get where you want to go in a single click. If you see figures in -red (with a minus sign) in front it means that the tariff is more expensive. A negative saving means you are going to be paying more. If all results show negative savings it basically means that you had a great deal (well done on that) but that there is nothing cheaper we can offer at the current time. This happens after energy prices have on the rise like has happened over the past 12 months. If you have a prepayment meter installed you cannot, unfortunately, apply for a credit tariff, for example one where you pay by direct debit, without first having your meter changed. In order to avoid dis-appointment we therefore only allow customers with prepayment meters to apply for prepayment tariffs. If you have a prepayment meter and applied for a direct debit tariff your application will get rejected and we wouldn’t want that, would we. We hope you found this guide useful and that it helps you get the best from our unique energy comparison service. If you have any suggestions please get in touch. If you’re ready to crack on with it pop your postcode into the box below to get started.